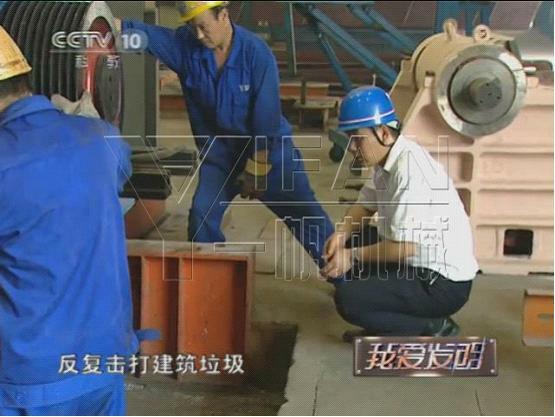 Mining crusher , sand making machine , mobile crushing plant and construction waste disposal equipment R & D manufacturer and domestic crushing and screening industry first on the CCTV program enterprise - Zhengzhou Yifan Machinery Co. , walked into CCTV "I love the invention " section .
" I love the invention " part of this theme is based on scientific and technological innovation "anchored encourage enterprises to create value , construction waste equipment , the personal has developed innovative concept to achieve value . Zhengzhou Yifan Machinery Co. , Ltd. is one of the earliest original enterprise engaged in the construction of waste disposal , Yifan company construction waste equipment in the past few years the glorious cause in domestic crusher industry professional handling of construction waste equipment Yifan machinery has been in the lead position . Yifan Machinery independent construction waste disposal equipment to develop a variety of models , such as jaw crusher series mobile crusher station , back-breaking series mobile crushing plant , cone crusher series mobile crushing plant and impact -breaking series mobile crushing station , these the salient features of the series of construction waste disposal equipment is highly efficient energy saving and environmental protection , greatly reduce Caqianfei and location convenient to the device of choice for the aggregate and the two industries of construction waste ! Yifan mechanical construction waste disposal equipment on the road to promote China's construction waste to recycling contribution to excellence , a time reputation rose to become a major news sites , magazines , newspapers , television programs competed broadcast brand products . Yifan manufacturing state-of-the-art international construction waste disposal equipment companies in addition to the professional R & D , but also has many advantages and high-tech new products , such as PE jaw crusher , JC jaw crusher , PF impact crusher , HCP hydraulic counterattack crusher machine , SMH hydraulic cone crusher machine SMG single cylinder cone crusher machine , VI impact crusher machine , stone production line , sand production line , jaw broken mobile crushing plant counterattack breaking mobile crushing plant , cone breaking mobile crushing plant , impact breaking mobile crushing plant , crawler mobile crushing plant , etc. , are the world's leading technology and independent innovation products. Yifan Machinery will consistently strive to meet the diverse needs of customers , "Yifan , and sincerity extremely service goals, including speed , extreme, strongly three aspects . Yifan machinery for the purpose to serve as customer service , reflecting the genuine and sincere attitude Yifan service , and perfect, never stop pursuit ; convey speed , strongly , the ultimate " brand support , Yifan services sincere attitude of the family , as well as fast, intentions , professional service standards . Tel: +86-371-64628852 Fax: +86-371-64628872The article by Crusher,Stone Crusher Yifan Machinery Editor: http://www.stonecrusher.org, please indicate the source , little effort , thank you .